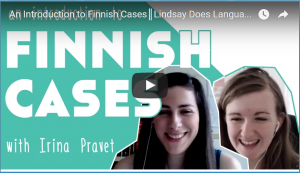 I’m happy to announce Lindsay Dow, from lindsaydoeslanguages.com, and I collaborated to bring you a super concise post on Finnish cases and their basic usage! This is just a picture, scroll down for the video. I first met Lindsay at the Polyglot Conference in Novi Sad in October 2014. She was doing an interview for her website www.lindsaydoeslanguages.com – home to many amazing language-related & travel videos – to share with language lovers around the world. I soon found out Lindsay hails from the UK and happens to have an insatiable appetite for learning new languages! So when Lindsay asked me what the deal was these all these Finnish cases, and whether they were really as hard as people said and if I could teach her more about them, I jumped at the idea! So we got to putting together a big post to explain it all. As part of the post materials, we made a video explaining the 6 local Finnish cases. (40 mins and I promise you the time just flies by.) This was Lindsay’s first time hearing about Finnish cases (she’d only heard the horror stories). She asked some really insightful questions as we went so I highly recommend watching! “And there we go. Finnish cases aren’t the deathly horror story 9 out of 10 internet memes would have us believe. I have to admit, when I first spoke to Irina about this I was nervous that our chat would go right over my head. Murmurs of the difficulty of Finnish blurred my vision and I was expecting to understand nothing beyond the genitive. a downloadable travel essentials guide – all in 1 page!